This switch is based on a mechanism that has proven itself millions of times. It is extremely rugged and durable (ball switch). 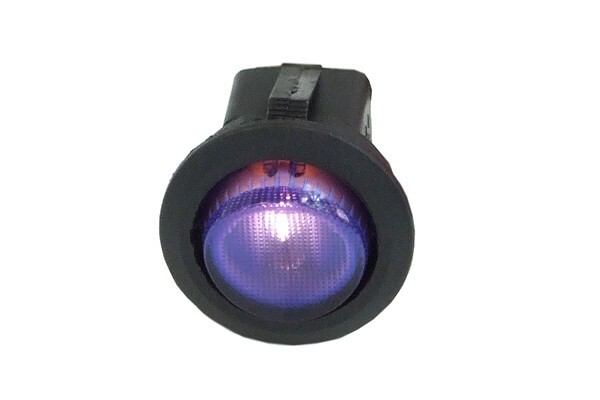 Outstandingly looking round rocker switch with satin mate surface and blue LED. The switch has a distinctive contact response. Simple installation with notched retention mechanism for case wall thicknesses between 0,75 and 3mm. Secure hold in the case due to tolerance equalization notches in the switch case. Caulked connectors for secure contact and installation of the push-on contacts. The LED lights up when the switch is in ON-position.